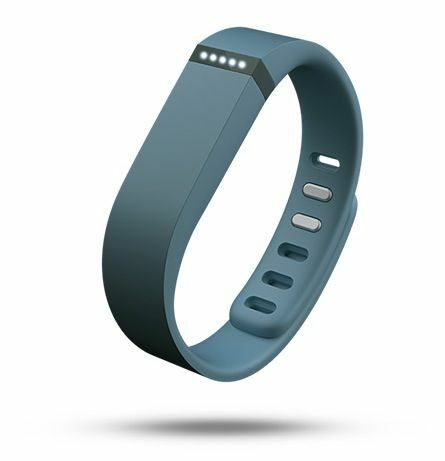 The FitBit Flex is a $99 rubber band you wear around your wrist to track how many steps you’ve taken every day. It connects via Bluetooth to your iPhone, or through a dongle to your Mac. If you are utterly sedentary, it’s a fantastic gadget that may very well encourage you to make some slight adjustments to your lifestyle before your heart explodes in front of your computer desk one day. If you are already even lightly active, though, the FitBit Flex is a puzzle of a product that seems fetishistically focussed on how much you walk while utterly ignoring how much you bike, swim or even run. The Fitbit Flex has been getting a good deal of positive press lately for its no-frills, light weight approach to activity tracking, and it’s easy to see why: it’s a good design. The heart of the Flex is a small Bluetooth dongle about the size of the first joint of your pinkie finger that inserts itself into a stylized rubber band around your wrist. These bands are swappable, and come in numerous colors, so you can accessorize them to your outfit to an extent. The Flex is very small and light, and only has five LED lights that show you throughout the day what percentage of steps you’ve taken towards your daily goal. 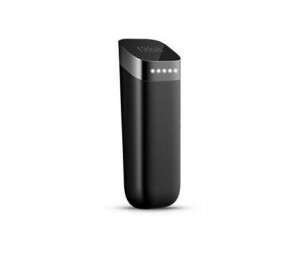 Consequently, battery life is pretty great: the FitBit Flex can go a week between charges easily. All together, this adds up to a gadget that is a pleasure to wear: it doesn’t do much, but it’s also easy to forget. The Flex outside of its rubber band holster. The good news is that the FitBit Flex tracks steps very well. You wear it on your wrist and it just keeps on counting the tiny little bumps of your tread throughout the day, squirting them through Bluetooth 4.0 to your connected iPhone or to your Mac when it’s in distance for tracking. Even without your phone, you can see how many steps you’ve made towards your daily goal by tapping the Flex, which will show you a series of lights, each one equivalent to 2,000 steps. When you hit 10,000 steps (or any other goal you set), the FitBit Flex vibrates and its lights twinkle to show you you’ve managed to make your daily quota: anything over that is just gravy. All well and good, and like I said, the FitBit Flex is just great at counting steps. The problem, though, is that counting steps is actually a fairly one-dimensional way to track fitness, or even activity. And that’s pretty much all the FitBit Flex does. To be sure, 10,000 steps a day sounds like a sizable amount, and in fact, it is: it’s about the equivalent of walking five miles a day. But truthfully, you need to be almost pathetically sedentary to not make close to 10,000 steps a day just in the course of your daily activities. Need proof? Look at me. I work from home, I have no commute, I live and work in a small apartment, I have a BMI of over 30, and in the last three weeks of testing the FitBit Flex, there’s only a single day I didn’t make a 10,000 step goal… and that was a day I essentially spent entirely on the couch. Even then, I missed 10,000 steps by less than fifty steps. This is not a high hurdle to clear. 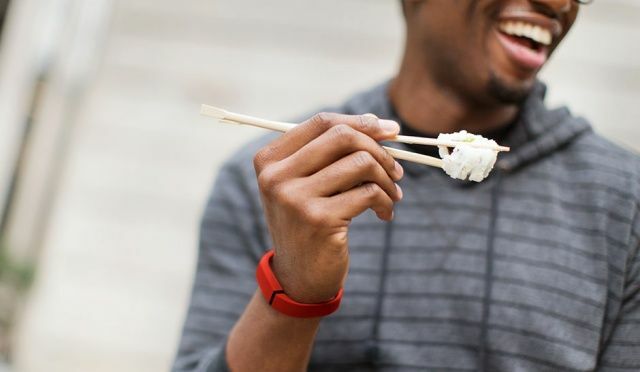 By default, the Flex does not track the eating of ramen. 10,000 is only the default goal, of course, and FitBit claims it’s roughly 50% more steps in the day than the average American takes… a fact which is almost too depressing for words. But the point remains that if the Surgeon General’s recommendation to doing the bare minimum to reduce your risk for disease is so easy to maintain, then for an activity tracker to be truly useful, it needs to be helpful in tracking other types of activity as well. Walking’s just not enough. But for the Flex, walking is the only activity it tracks automatically, and steps are its only currency. For me, this was the most frustrating thing about the Flex. Every morning, for example, I usually swim a mile at the local YMCA, but the Flex, while waterproof, can’t register that at all. Competitors such as the Nike Fuelband can at least measure that I’m doing some sort of activity there, but as far as the Flex is concerned, if I’m not walking, it’s not tracking. The same is true with bicycling, another thing I do fairly regularly. And while the FitBit Flex does count the “steps” of the five mile jogs I take three or four times a week, it can’t distinguish that steps made while running might be of a higher value than steps made between the couch and the refrigerator. To be fair, the FitBit companion software allows you to track all of these activities, but the Flex itself just doesn’t care. The Flex has some other cool features besides step-tracking. The Flex will track your sleep, but not particularly well; it registers every movement in bed as a period in which you have woken up. It will also function as a “silent” alarm, buzzing you awake in the morning, which if you sleep with a partner might be its neatest overall trick. And that’s about it. All for $99. There aren’t really major strikes against the FitBit Flex at the end of the day. If you do more activities than just walking, you can enter them all manually into the app, along with meals eaten and other such details, while the Flex itself keeps track of your passive activity throughout the day. Overall, it’s a pretty good picture of your total health. Even so, I think it’s important to temper expectations with the Flex. 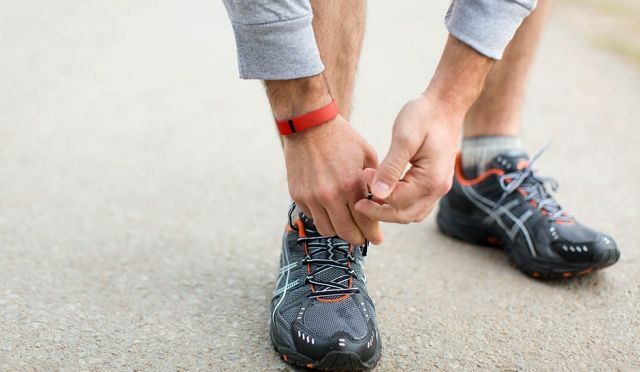 In truth, unless you’re willing to heavily invest time and effort into FitBit’s activity tracking software, the Flex will be an underwhelming accessory for anyone who is moderately active already. And as a motivational tool? The Flex is best aimed at either the utterly sedentary, or those for whom other types of exercise besides walking are difficult or impossible. The Good: Tracks steps like a champ. Unimposing and easy to wear. Long battery life. Cheap at $99. The Bad: If you’re already active, tracking steps and steps alone just isn’t enough. The Verdict An excellent device for the truly sedentary, but more active users might quickly find it superfluous.